Discouraging your cat from leaving the garden can be a seemingly impossible task. While you may not be able to stop your pet from venturing over the fence, you can create a cat-friendly garden that your pet will want to spend more time in. Here are our tips for creating a garden that your cat will love! If your cat is the active type, think about setting up a garden that will keep them entertained. This can include logs and trees that your cat can use to play. It’s recommended that you cover the ground below with mulch to protect your cat if they fall while climbing. Avoid cocoa-based mulches though; these contain theobromine, which can be toxic if ingested. 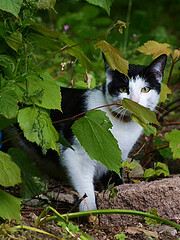 Planting sturdy evergreens in your garden can help your cat to feel protected and offers hiding places. Hedging can also help your cat to feel less threatened by the presence of other cats, although this is no guarantee that they won’t venture into your garden. Where possible, don’t plant near to entrances, prominent corners and other obvious places. There is a very big risk that these areas will be used for a toilet by your cat! Be careful with what you plant in your garden; many plants are dangerous for cats and some are poisonous. By nature, cats are not particularly inclined to eat plants other than grass. However, this can change if grass is not readily available so it is important to know which plants are not suitable for a cat-friendly garden. Lilies and foxgloves can be particularly toxic for cats and both of these plants can cause kidney damage if they are ingested. Contact your vet if you are concerned your cat has ingested anything dangerous. If in doubt, it’s best to play it safe with plants that are recommended for gardens with cats. These include bamboo, lavender, roses, snapdragons, sunflowers, violets and herbs (such as dill, basil, rosemary, mint, sage, parsley and tarragon are all deemed cat-friendly and can have positive effects on your cat’s health if they are eaten). You may also like to introduce some catnip into your garden, especially if you want to discourage your cat from straying too far away. Many chemical-based garden products can be harmful for your cat. For example, slug pellets can be toxic if your cat accidentally ingests them. Organic and natural products are the best move and should have no adverse effects for your cat. Do you have any extra tips for creating a cat-friendly garden? Share your stories in the comments section below! We have a completely cat friendly and safe garden..Many years ago one of our cats disappeared, never to be found even after months of searching etc.We live in a rural area away from busy roads.We fenced in our back garden with plastic coated chain link fence, complete with overhang. The cats are happy and safe now and have a variety of climbing posts, logs, catnip, lavender and herb plants and last year I bought them a cheap paddling pool and plastic ducks to play with. Your garden sounds great – wish I was a cat! I would love do do this to my garden Pauline as my cats are indoors and it would be great to let them out. Is this a plastic chain link fence with a plastic sheeting to cover the chain link gaps? Hi Tess, it is plastic coated wire with Twilweld around the bottom two foot of the fence. It was safer when we had kittens as they couldn’t push their heads through the links. I suppose you could use plastic sheeting as well but we find the Twilweld works well.I would be pleased to answer any other queries you have. Pauline. What lucky cats they are to have owners like you! I applaud your hard work to create a safe yet happy secure place for your cats. My cat is an indoor cat with access to a secure garden area. When we got him from a rescue centre I asked for a cat that would be happy many indoors, as we live near a busy road, and there are so many cases of cruelty to cats these days. I couldn’t bear the worry if he was just roaming around. Lots of people seem to think cats can’t be happy living like this, but if they could see my boy upside down snoring in his own private ‘sun house’ right now I think they’d soon change their minds! Our cats are perfectly happy in their own garden and like you D.Ferris, I couldn’t think of letting our cats be free roaming now.It takes all the worry away knowing exactly where they are. A lot more people either have indoor or safe garden cats now because of the world we live in.